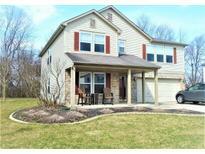 Below you can view all the homes for sale in the Kingsley subdivision located in Noblesville Indiana. Listings in Kingsley are updated daily from data we receive from the Indianapolis multiple listing service. To learn more about any of these homes or to receive custom notifications when a new property is listed for sale in Kingsley, give us a call at 317 979 0009. Enjoy evenings on the deck in fenced backyard with room to entertain, play, garden. Great location. MLS#21632371. RE/MAX Edge. Don't miss this opportunity for awesome location & sf! MLS#21630518. Carpenter, REALTORS®. Washer and dryer stays with house. MLS#21629761. RealAmerica Management, LLC. One Year Home Warranty is included. MLS#21629678. F.C. Tucker Company. Sleek deck off the back patio ...newer roof, AC and water heater --- all appliances stay --- Convenient neighborhood on 146th St is a short drive to Indy, Carmel and Westfield with shopping and dining options everywhere --- check out Dillon Park! MLS#21618432. The Dream Home Company.